Super Hero Boy: The perfect gift for grandparents or parents on the go. The perfect gift for grandparents or parents on the go. I love showing off pictures of my son, so much so that I even have his pictures on the back of my business cards like they were trading cards. I usually carry around an arsenal of pictures either via my mp3 player or my camera but I know my parents tend tp carry around actually pictures and that can get bulky. Sometimes I wish I had one central little gadget or place to store Connor's pictures so when some poor sucker asks me what my son looks like I can bring them out and show them. Needless to say I've been looking for something to give my dad for some time that he could carry around his pictures of Connor in and look at wherever he goes. Dad is as sentimental as I am when it comes to pictures so when I saw the digital key chains over at the Discovery Store I knew I had found the right thing. So many digital key chains I see are so girlie so honestly I had never even considered one up till now. The stainless and black finish on the Discovery Store Digital Keychain is really attractive and its not too bulky that you cannot fit it in your pocket or purse. Though still a bit thicker than an average key chain its about the size of a small box of matches or not much bigger than a pocket knife so I know it will comfortably fit in my dad's pocket. I recently loaded the key chain with pictures and the process was pretty painless, though I had hoped it would work much like a usb drive it ended up working about the same as loading my mp3 player with songs. You hook it up to your usb port via a included cable, load the small software program that's included, and then pick the pictures you want to include. I loaded about 20 pictures and there is easily still room for more (the packaging says 54). Afterwards you just unplug the key chain and its ready to go. As well as holding your pictures the key chain also works as a clock, alarm clock and tells you the date. That alone is worth the money to me as regardless of the fact that I write here every single day don't even bother asking me the date if you see me in public its rare that I even know what day of the week it is much less the date if I am not sitting in front of the computer. Blame it on the fact that I get very little sleep but I'm pretty helpless without the clock/calender on my computer. 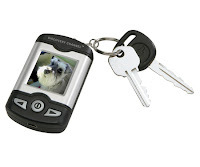 The Discovery Store Digital Keychain is affordable enough to be a stocking stuffer but cool enough to be a main gift. It's certainly the gift for the person on your list that already has everything else and I'm really considering buying a second one for my purse. Honestly the only thing I wish at all about it was that it ran more like a USB drive when attached to the computer so you would not have to use the software but thats really a tiny gripe as with the 50+ picture storage ability I doubt I will end up reloading pictures that often. You can pick up your own Discovery Store Digital Keychain over at the Discovery Store!